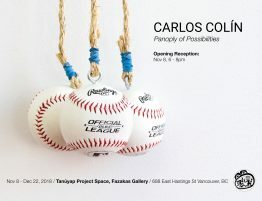 Fazakas Gallery’s SOLO theme Collaborationfeatures a unique partnership between two Canadian artists, Chief Rande Cook (Kwakwaka’wakw) and Carollyne Yardley, as an aesthetic response to the relationships and exchanges between native and non-native communities, and how these relationships are healing and flourishing through cross-cultural exchanges. 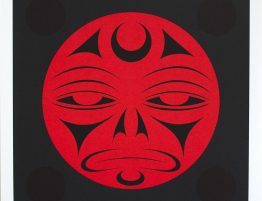 The concept of Collaboration is influenced by Cook’s masterful use of traditional Kwakwaka’wakw iconography seen on Northwest Coast potlatch regalia, and Yardley’s self- coined term ‘Squirrealism’ used to describe a deep exploration of metamorphosis and identity through her richly detailed neo-classical inspired paintings of masks and hybrid/animal beings. The result is an energetic body of work that poetically exhibits the tension and synchronicity inherent in the creation of entirely new visual and material forms. Join a selection of Art Toronto’s SOLO artists as they discuss their work through the lens of shared themes. 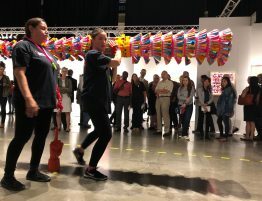 Each talk will feature at least four artists and analyze works exhibited within the context of the fair in conversations moderated by art professionals. SOLO Salon talks take place at 5 PM in the SOLO space. Talks are approximately 45 minutes long and are complimentary with admission. William Huffman, arts administrator, curator, and educator of Dorset Fine Arts, the Toronto division of Cape Dorset’s West Baffin Eskimo Cooperative, in conversation with artists Celia Perrin Sidarous, Rande Cook and Carollyne Yardley, Jay Dart, Miles Gertler and Kris Knight.